Peak Golf Queenstown is New Zealand premier golf services provider, we can arrange everything from transport to tuition, green fees to car hire. Queenstown has 5 top 20 ranked golf course all situated within a 20 minute drive from the CBD. Millbrook Resort (NzOpen), The Hills and Jacks Point headline our marque courses, but both Arrowtown and Queenstown offer unique challenges to the traveling golfer as well. To get you next Queenstown golf trip underway please do not hesitate to contact us. Stunning day out here today with lots of visitors out enjoying the conditions. UNWIND Caf'e monthly medal tomorrow tee off at 8.00am or midday, the two's jackpot is $10.00 so tick the box and add another .50c, you never know. Your hosts in the window tomorrow are Bradley Paterson and Rob Oakes. The greens have had the big mowers on them today and look OK.
Hope to see you out here tomorrow. The interclub team to play at Queenstown tomorrow starting at 11.30am are in no particular order Bill Weir, James Castle, Jeff Smith, Tim Clark,David Johns & Phil Neilson. The team are second with Alexandra and only 18 shots behind Cromwell. Good luck out there tomorrow! At the A.G.M. last night the recommendation from the committee was passed, the new subscription for a full member will be $545.00. There will be a 5% prompt payment discount available if paid by 30th November, rounded down to $517.00. Other membership categories increase on a pro rata scale. Peak Golf Queenstown is a leading golf services provider in New Zealand's top golf tourism destination. If your coming to Queenstown for golf let Peak Golf Queenstown organise your next golfing holiday or tour, we can arrange everything from green fee to transport to hotel accommodation. 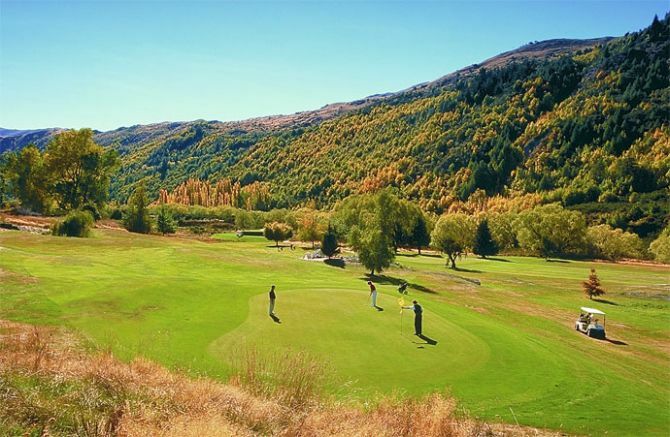 Arrowtown Golf Club , enjoy the best golf in Queenstown with Peak Golf Queenstown. HENRYS Stableford tomorrow for those not playing Millbrook Cup matches. Your hosts in the window are Steve Ebsworth and Tim Clark. The Two's jackpot was struck last week so we start again. Mixed field starting at midday, forcast looks good so come out and enjoy the day. The club have three teams in the regional pennant finals at Millbrook on Sunday, the Senior B and Intermediate teams both take on Wanaka teams in the morning. The Junior team play Dunstan in the morning, wins are required for the teams to progress to the afternoon round. The teams would appreciate any support you can give them. If you are available to caddy please let Tim Clark know tomorrow. The clubs AGM will be on Thursday 26th October, the notice of AGM with reports and financials will be emailed to you all in early October. Please mark this date so we have a good turnout. It may be the first day of spring but the wind out here will cut you in half. If you are coming out for a hit dress warmly. COW Medal tomorrow gents, normal start time at midday. Your hosts in the window are Bill Churstain and Rob Oakes. The two's jackpot starts again after Granville and Paddy shared the pot last week. Cadrona Cup points restart again tomorrow, the two leaders Chris Cockrane and Jono Jackson lead by a lot. The Interclub team played at Cromwell last week, they finished mid pack and need some better results in the next few rounds. The Presidents grade pennant team had a half with Queenstown which was a good effort away. Women goes to the local newspaper office to see that the Obituary for her recently deceased husband is published. "Well then, let it read : Fred Brown died." Amused at the Womans thrift, the Editor tells her that there is a seven word minimum for all Obituaries. She thinks it over and in a few seconds says, " In that case , let it read: Fred Brown died.... golf clubs for sale.